Requirements were INTRODUCED effective around November 15, 2016.
and the badge and pamphlet became available in January, 2017. As you work on the Exploration merit badge, remember to always use the buddy system. Whether you are out in the field or meeting with your merit badge counselor, having a buddy will help ensure everyone's safety. You and your buddy can watch out for each other wherever you may be or whatever you may be doing. Expeditions are widely variable. You do not have to climb Mount Everest or go to a jungle to be an explorer. 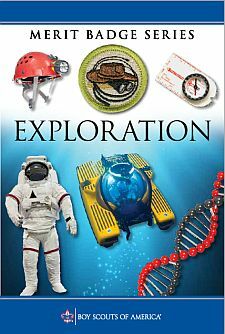 For this merit badge, an expedition should be viewed like a field trip or science project. While you cannot just hike some place and call it an expedition, you can hike to a location and study an aspect that interests you. The major difference between an expedition and a field science trip is that you (with your counselor's guidance) have to plan everything. You have to formulate objectives and plan an agenda. As needed, you will need to do things like confirm transportation, arrange communication, plan for food and medical supplies, acquire all food and other supplies, construct safety and possible evacuation procedures, manage any adverse events, and prepare a report after the expedition. Evaluating the effects of a storm on the local forest or nature preserve, the effects of a drought on a field used by birds and mammals, changes in butterfly populations due to loss of wildflower habitat, incursions by invasive plant or animal species, insect diversity, and presence or absence of amphibians or fish are just some of the examples that can be studied and reported. Your imagination is your only limitation.